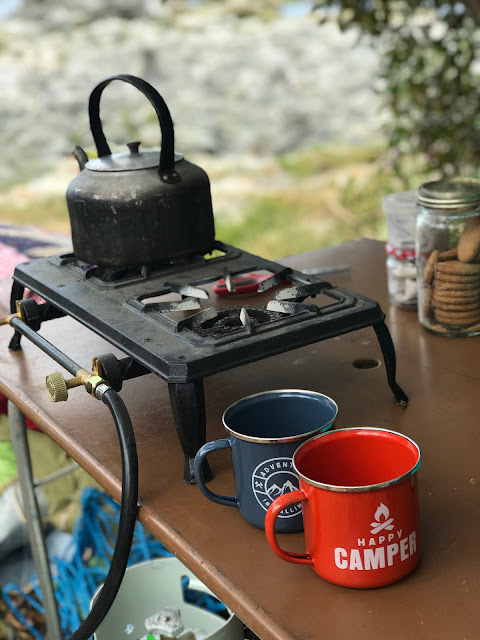 DEB ROBERTSON WRITES....: We went camping and it was ok.
We went camping and it was ok. Remember how I wrote about reclaiming summer? Well a few months ago in the dead of winter, I was working one Saturday and decided there had to be more to life than work. I rang up and booked a camping site by the sea; and this weekend we went to stay. We did it all. We may have accidentally taken the tent without poles or fly and had to sleep in the gazebo. We may not have rated a single vegetable unless you count an onion. But we went away, we loved watching the sea do it’s thing and we enjoyed being with each other. but on the whole even the Resident Teen seemed to enjoy himself. and Chrissy says (in a seagull voice) "ooh what's this? spicy worms!". Still chuckling over that one. So if we can save enough $$$ we plan to try again at Christmas. oh and a proper tent and a water container. Oh and a tent. Ahem. Sounds like a fabulous adventure!